Greetings from Uniondale, Long Island, New York, where Kathy and I have a family wedding this afternoon. Before the rehearsal dinner last night, we spent the day in Manhattan. We didn’t spot the pope, but Kathy’s daughter, Meaghan, uptown while we were in Chelsea, captured this photo. 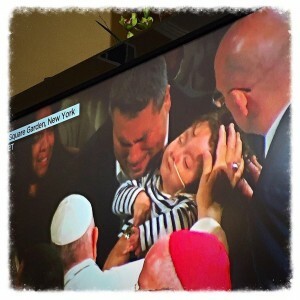 I’m also attached an iconic image that our own David Stevens snapped as he watched coverage of Francis’s arrival for his evening mass at Madison Square Garden. It was a good day to visit churches in a city that brims with them. I attended the 12:05 p.m. Holy Eucharist service at St. Bartholomew’s on Park Ave., where the celebrant, the Rev. Dr. Patrick Cheng, preached spiritedly on Jesus’s question to his followers: “Who do you say that I am?” A little after one, I made it to a gloriously restored St. Patrick’s Cathedral on Fifth Ave., where Francis had attended vespers the evening before. Mass was underway there, too. As I stood in the back, a priest read the same passage from Mark 8, and the same question: “Who do you say that I am?”Two great churches, with much in common and differences that we are absolutely right to take seriously. Two churches, thousands of global denominations and sects, and yet one Savior — and, this week, Francis’s insistent and always gracious invitation to the unifying power and core Christian principle of self-sacrificial love for the sake of others. On the 18th Sunday after Pentecost (Sept. 27), St. John’s will worship at 8 and 10 a.m. In the spirit of Francis’s message, our celebrant, Mo. Martha, has an exciting announcement about our new Laundry Love ministry. She will also welcome our colleague and friend the Rev. Christine Purcell as guest preacher. Please note that we will not offer a service this afternoon (Saturday, Sept. 26). As he mentioned this week when he discussed immigration, Francis is the Buenos Aires-born child of an Italian immigrant father. His personal story informs and bolsters his faith and world view. The same is true of us all. God invites us to the unity of Christ out of our idiosyncratic and indispensable (at least to God) individual experiences. During the 9 a.m. Christian formation hour this Sunday, Sept. 27 in the Bishop’s Room, join facilitator Mitch Garcia and Mo. Martha for the second installment of “Storytellers.” We had a moving, revealing conversation when this ministry begin two weeks ago. You’ll be glad you joined in this Sunday. Speaking of promoting unity, the men’s ministry team discovers each year that one of the hardest jobs in Christiandom is getting busy guys to realize that they really can take a weekend away to enjoy a closer walk with God and one another. Gene Giordano reports that we still have three spots available, complete with carpool transportation, to our retreat next Friday-Sunday, Oct. 2-4 at the Aldersgate Retreat Center in beautiful Pacific Palisades. Our retreat leader, the Rev. Scott Richardson, has news we all can use about putting our Christian principles to work and living less anxious, more joyful lives. When I ask men around church if they’re joining us, they often say they’re too busy. My friends, Christianity is a faith of paradox, and here’s another: If you’re too busy to go, then you probably need to go. If you’re been considering it, you’re more tempted now, and you don’t want the church budget to take it on the chin for your unused spot, then call or write Gene today at 949-292-1471 or gvgiordano@gmail.com. We also have a chance this weekend to participate in the unity of St. John’s Church and School (one community with complementary missions) by attending the St. John’s School Fall Family Festival on the athletic field this Sunday afternoon, Sept. 27 from 4-6 p.m. The kids will love it, and you will do: Games, great refreshments, and fellowship.